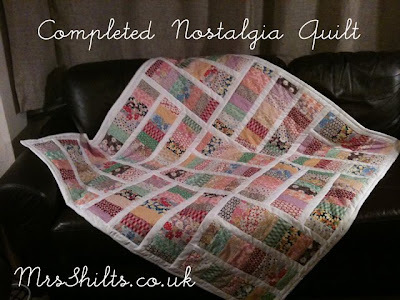 Its lovely to be able to share these pics of Mrs Shilts quilt with you! "After reading your blog, I thought I'd share with you a picture or two of my first ever quilt that I completed this weekend. My in-laws bought me one of your 'Nostalgia' jelly rolls for Christmas and I have since been working on this in the evenings. I didn't have quite enough fabric for the pattern I was using so bought some more from your store and some yardage for the back." This is true first quilt joy here. So, you've actually finished your quilt (it took longer than you expected), the final stitches on the binding are made (no one tells you how long it takes to do the binding either do they..) and...you drape it elegantly over your sofa. You probably step back from it and admire your handiwork from many angles and then you just have to take a picture! I've even been known to walk out of the room and walk back in just to see how good it looks. This is all completely normal behaviour. Next step - blog about it! Read more here - link to Mrs Shilts blog. Quite rightly she is very happy with her quilt - its amazing to think this is her first ever quilt. "I'm so pleased with how its turned out, I'm already planning quilt number 2 and quilt number 3. My advice to other first time quilters is to not be afraid of trying something different because this is how you will learn and improve. 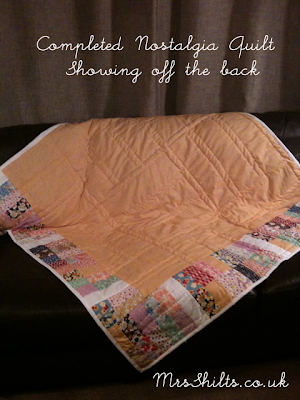 When I first started the quilt I didn't know how to bind the quilt but with the help of tutorials on other blogs i've been able to learn how to bind and make the corners look just right." We LOVE to see the results of your work - please do send your pics - we'll post them here just like we did with Mrs Shilts. Wow. If that's what she's producing for her first quilt what's she going to come up with next! Amazing work. I know! A really impressive first quilt with huge potential for her next project!